The contemporary "nature of science" involves the union of science, mathematics, and technology where computer-coded equations are solved to help understand satellite and ground observations and predict future conditions. This video can be used to introduce the roles of data, scientists, and computer models in predicting weather and climate conditions. The animation includes several examples of visual results of computer model runs. 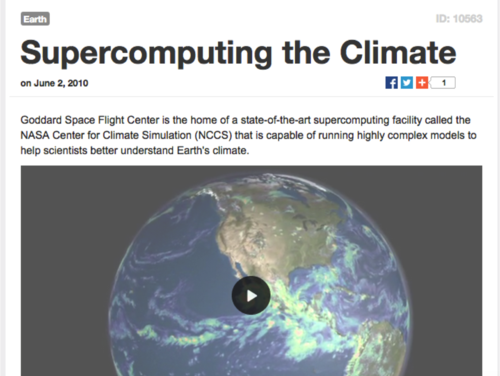 While there is some advanced reference to the NASA Center for Climate Simulation (NCCS) and current NASA / Goddard Space Flight Center approaches, the visuals may help general audiences understand the scientific material. Prefacing the video with a definition of computer models as "systems of equations that represent physical systems" may help prepare students to understand the abstract concepts of weather and climate models. You may want to follow the video with a review of data assimilation, in which models run forward to make predictions, then actual observations are brought into the system (assimilated) to give the model an accurate snapshot of reality before making the next set of predictions. There is no specific teacher's guide for this video. There is a transcript of the narration at: http://svs.gsfc.nasa.gov/vis/a010000/a010500/a010563/NCCS_transcript.html. The video is available in multiple sizes and formats.